A number of years ago, my middle son Mark graduated from Simon Fraser University in Chemistry. 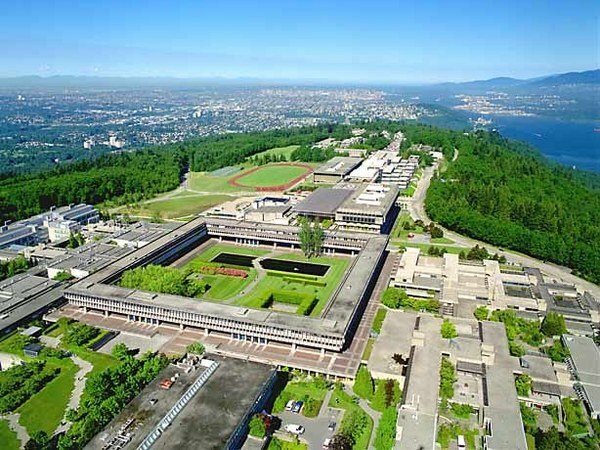 SFU was named in 1963 by Leslie Peterson, the Provincial Minister of Education, because SFU overlooks the very river where Simon Fraser made his historic journey to the Pacific Coast. My earliest memory of SFU was walking through the beautiful new plazas in the 1960’s, and then hearing about the student protests that paralyzed the university. One of the most puzzling demands of the students was that SFU be renamed Louie Riel University. What is it about Simon Fraser the Explorer that seems to both repel and attract people? Why is it that he is the least well known of all Canadian explorers? The Greater Vancouver Book holds that Simon Fraser could be called the founding father of British Columbia because he built the first colonial trading posts west of the Rockies. Fraser, however, is best known for his bold exploration of the great river which bears his name. On the Canadian Peace Tower in Ottawa is the verse “He shall have dominion from sea to sea” (Psalm 72:8) By Simon Fraser’s heroic journey to the Pacific Coast, he made it possible for the Dominion of Canada to stretch from sea to sea. Fraser’s was the third expedition to span the continent of North America: after Alexander Mackenzie and Lewis & Clarke. Simon Fraser felt like a total failure when he reached the Pacific Coast. Yet his remarkable quest kept Canada from remaining land-locked at the Alberta border. Simon Fraser was one of the most successful failures that Canada has ever known. Descended from a well-known Scottish Highland family, the Lovat Frasers, Simon ‘Jr.’ was the youngest son of Simon Fraser of Culbokie and Isabel Grant of Duldreggan. In September 1773 the family joined a celebrated migration of Highlanders who travelled to America on the SS Pearl to seek their fortunes in the New World. In 1775, the year before the birth of their ninth child Simon, the first shots in the American Revolution were fired. Simon’s Pro-British father was captured at the Battle of Bennington. Every time he and his older son refused to join the rebels, his wife was fined another farm animal. Simon Sr. died thirteen months later from harsh treatment as a prisoner in the Albany jail. Mrs. Fraser fled as a United Empire Loyalist with her family to Canada in 1784. When Simon turned 16, his Uncle John Fraser, a Montreal judge found him a seven-year clerical apprenticeship with the famous North West Company of Montreal. In 1793 Simon was sent to the Athabascan wilderness to learn his trade at the secluded Peace River posts. By 1802 he was selected as one of the company’s youngest partners. In 1805 Simon was chosen for the important role of expanding the company’s trade to the land west of the Rocky Mountains from 1805-1808. 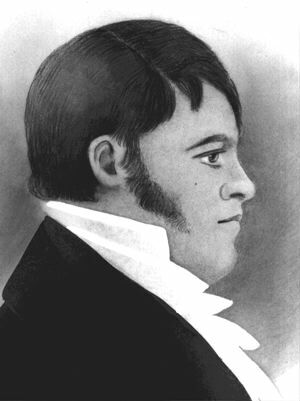 His mandate from the North West Company was to cross the Rockies and establish trading relations with the Indigenous people in the interior of what is now British Columbia, but which Fraser named New Caledonia. According to family tradition, Fraser selected the name New Caledonia because the country reminded him of his mother’s description of Caledonia, the ancient Roman name for the Scottish Highlands. Between 1805 and 1807 Fraser set up the first four forts west of the Rockies at McLeod, Stuart and Fraser Lakes and Fort George, making himself the pioneer of permanent settlement, in what is now the mainland of BC. What mattered now above all else to the Nor’Westers was the search for a route to the Pacific that would reduce the enormous cost of the long canoe-haul from Montreal. Only then would they be able to survive the competition from the Hudson’s Bay Company with its monopoly on all shipping to England via the Hudson’s Bay area. On May 22, 1808, Fraser left Fort George (Modern-day Prince George) with two clerks, John Stuart and Jules Quesnel, 19 voyageurs and two Indian guides. Simon Fraser named his lead canoe, Perseverance, which was also the motto of the North West Company and one of the greatest strengths of the Scottish people. 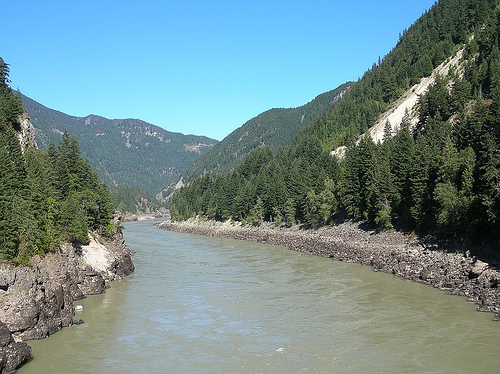 Fittingly, Fraser wrote at the worst of his Fraser River journey: “Our situation is critical and highly unpleasant; however we shall endeavour to make the best of it; what cannot be cured, must be endured.” As he explored one of the world’s most difficult and dangerous rivers, Fraser showed remarkable courage, stamina, and firmness tempered with restraint. In the midst of enormous strain, he never lost his temper nor acted unfairly. Simon Fraser travelled during the springtime flood, the most dangerous time of the year on the Fraser. After surviving numerous near-drownings and upset canoes, Fraser was at last persuaded that it was impossible to make the entire journey by water. 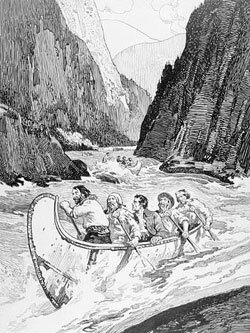 ‘Our situation was really dangerous’, Fraser wrote on June 5th, ‘being constantly between steep and high banks where there was no possibility of stopping the canoe.’ At the Black Canyon, they were forced to follow native guides as they climbed jagged cliffs using intricate scaffolds, bridges and ladders hundreds of feet above the raging water. One missed step would be their last. 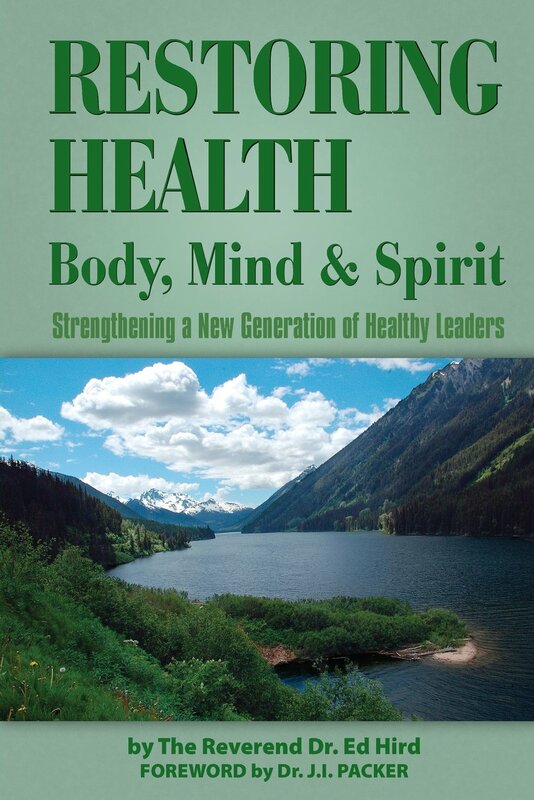 Simon Fraser commented in his journal: “I have been for a long period among the Rocky Mountains, but have never seen anything to equal this country, for I cannot find words to describe our situation at times. We had to pass where no human beings should venture.” Every bend threatened new dangers –perilous rapids, treacherous portages, and impassible whirlpools. Despite incurring a serious groin injury, Fraser completed the journey in 36 days (May 28th-July 2nd) and made the return trip in one day less (July 3rd to August 6th). He and his voyageurs had travelled more than a 1,000 miles of uncharted territory on the largest salmon-spawning river in the world. Sadly this greatest adventure of his life won him little fame and less reward, for the Fraser River was useless as a canoe Highway for fur traders. 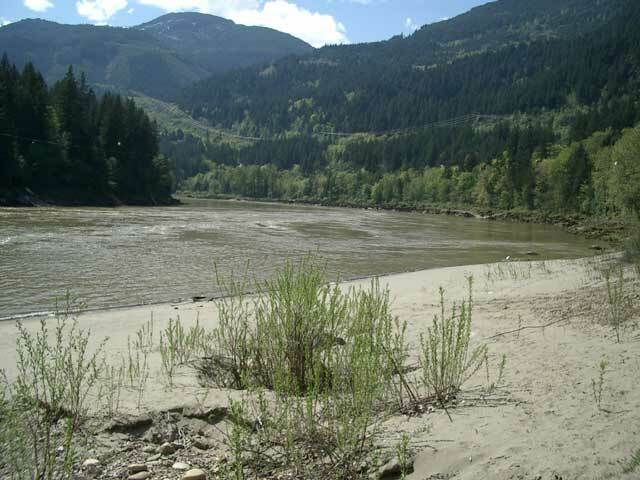 Even worse, this river which Fraser so successfully navigated turned out not to be the prized Columbia, but rather an unknown river which fellow Nor’wester David Thompson would later name the Fraser River. Before Fraser died in poverty and obscurity in 1862, he learned of the BC Gold rush with hundreds of prospectors rushing up the Fraser River, past the Fraser Valley, and through the Fraser Canyon. Over two hundred years later, I give thanks to God for the perseverance of Simon Fraser who ‘ran with perseverance the race marked out for him’. (Hebrews 12:1) May Jesus strengthen us this day to never, ever, ever give up in our journeys of life. Categories: BC, Canada, explorer, Simon Fraser, Uncategorized, voyageur | Tags: Albany, Alberta, Alexander MacKenzie, American Revolution, Anglican Mission in the Americas (Canada), Athabasca, Battle of Bennington, Black Canyon, Caledonia, Canada, Canadian Peace Tower, Chemistry, Culbokie, Duldreggan, Fort George, Founding Father of BC, Fraser Lakes, Fraser River, Highlanders, Hudson Bay Company, Indigeneous, Isabel Grant, Jesus, John Stuart, Jules Quesnel, Leslie Peterson, Lewis & Clarke, Louis Riel, Lovat Frasers, Mark Hird, McLeod, Montreal, New Caledonia, New World, North West Company, Northwesters, Peace River, perseverance, Prince George, Provincial Minister of Education, Psalm 72:8, Rockies, Scottish, SFU, Simon Fraser, Simon Fraser University, SS Pearl, Stuart, United Empire Loyalist | Permalink.